Malaysian Resources Corp Bhd (MRCB) is developing a RM1 billion office and residential project at Kuala Lumpur Sentral, the city's largest transportation hub. The project will be undertaken on a joint-venture basis with Gapurna Sdn Bhd, a local developer with 60 per cent share of the partnership. Work on the project, known as 348 Sentral, started last month. It is expected to be ready by the third quarter of 2012. "This is part of our RM3 billion expansion of Kuala Lumpur Sentral over the next few years," MRCB group managing director Shahril Ridza Ridzuan told reporters after the launch yesterday. MRCB is the master developer of Kuala Lumpur Sentral. 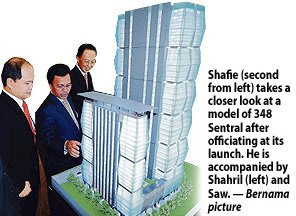 348 Sentral will be financed using internal funds and borrowings. "A couple of banks" are in the process of finalising a loan, Shahril said. The project will feature a 33-storey office tower and a 21-storey serviced residence tower sitting on a five-storey podium and a four-storey basement. The joint venture, GSB Sentral Sdn Bhd, will lease part of the office tower to oil firm Shell Malaysia to use as its regional office for 15 years. Shell will be its anchor tenant, taking up about 340,000 sq ft.
"We decided to consolidate our offices in the Klang Valley and 348 Sentral was the best offer we had," its chairman Datuk Saw Choo Boon said. The company currently has offices in 10 physical locations in the Klang Valley. 348 Sentral is said to be the country's first integrated commercial development going for the Leadership in Energy and Environmental Design (LEED) certification with gold standard, a US-based green building rating system. It will be Gapurna's first big-scale project, its chairman Tan Sri Abdul Halim Ali said. Shahril said he expected MRCB, which turned in sharply lower first quarter profit this year, to show better earnings in future quarters now that building material costs had fallen. Its first quarter profit fell by almost 99 per cent to RM153,000. On its upcoming transportation hub in Penang, he said the company was working on the final design and expected to get vacant possession of the site "shortly". A temporary hub has been built and is operational. The launch yesterday was officiated by Rural and Regional Development Minister Datuk Seri Mohd Shafie Apdal. KUALA LUMPUR: Hock Seng Lee Bhd (HSL) has received a RM125.7mil subcontract from Pembinaan Nomisual Sdn Bhd for the construction and completion of 1,000 houses in Bintulu, Sarawak. In a filing with Bursa Malaysia yesterday, HSL said the scope of works included the construction of the affordable houses, related external works as well as the mechanical and electrical works. The project is expected to be completed by April 2012. “The contract is expected to contribute positively to the earnings and net assets of HSL for the financial years ending 2009 to 2012,” HSL said. The prestigious Raffles Hotels & Resorts expects to be the most expensive hotel in Kuala Lumpur when it opens at Pavilion Kuala Lumpur in 2011. Raffles is now the rate leader in seven out of the eight markets it is in. In Dubai, the rate leader is the Burj Al Arab in Dubai. In Singapore, Raffles last year closed at an average room rate (ARR) of S$1,000 (RM2,420) per night. Fairmont Raffles Hotels International (FRHI) executive vice-president David Roberts expects the hotel to have an ARR that's a fifth higher than the leader at that time. "We will position ourselves as a rate leader," Roberts said. Currently, the rate leader in the capital is Mandarin Oriental at over RM600 per night. Roberts was speaking to reporters following an agreement signing ceremony between Raffles Hotel Management and Harmoni Perkasa Sdn Bhd. Harmoni Perkasa is a wholly-owned subsidiary of Urusharta Cermerlang Sdn Bhd. Pavilion Kuala Lumpur is 51 per cent owned by Urusharta and 49 per cent by the Qatar Investment Authority. 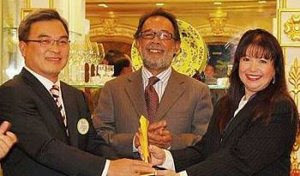 The signing ceremony confirmed a Business Times story in April that Raffles will open at Pavilion Kuala Lumpur in 2011. Raffles Kuala Lumpur will have 200 rooms and suites measuring a minimum of 50 sq metres - 50 per cent larger than most five-star hotel rooms. Raffles expects to be able to achieve a gross operating profit of between 35 per cent and 45 per cent in Malaysia. FRHI, meanwhile, has confirmed the opening of 15 more Raffles hotels between 2010 and 2012. KUALA LUMPUR: The luxury hotel brand Raffles will have its first hotel in Malaysia - the Raffles Kuala Lumpur - which is expected to open its doors in 2011. The Raffles Kuala Lumpur will be at Pavilion Kuala Lumpur, along Jalan Bukit Bintang. Featuring 200 rooms and suites, each with a minimum of 50 sq m (about 538 sq ft), it will offer the most spacious rooms in the city. Raffles Hotels & Resorts' signed an agreement on May 28 with Harmoni Perkasa Sdn Bhd, a unit of Urusharta Cemerlang Sdn Bhd, which owns Pavilion Kuala Lumpur. "The name Raffles is associated with exceptional standards of service, hospitality and cuisine. We look forward to working with Raffles Hotels and Resorts to bring a luxurious lifestyle experience to Kuala Lumpur," said Harmoni Perkasa chairman Tan Sri Zainol Mahmood. Owned by Fairmont Raffles Hotel International, Raffles Hotels & Resorts is expected to expand from seven Raffles hotels now to 23 hotels worldwide by 2012. Chris Cahill, COO of Fairmont Raffles Hotel International said the group had always wanted to extend the Raffles portfolio to Kuala Lumpur. "Now we have an ideal strategic partner and an unrivalled location," he adds. The group also owns Fairmont and Swissotel brands of hotels and resorts. Raffles Hotels & Resorts' public relations and communications manager Vivian Koh said Raffles Kuala Lumpur will offer six restaurants and bars including a specialty restaurant, an all-day dining restaurant, a lobby lounge, a lobby bar, a pool bar and a Cafe Stelle located at the Couture Pavilion precinct. The cafe which will be a showcase of Raffles' service prior to the opening of the hotel, opened its doors today. The Raffles Amrita Spa, a signature component of Raffles hotels and resorts worldwide, will feature 10 treatment rooms and an extensive range of massage and wellness treatments. PROPERTY developer MK Land Holdings Bhd has drafted a five-year roadmap, which will focus on developing two core products within its ongoing Damansara Perdana township in Selangor in a bid to enhance profitability. They are the Armanee Terrace condominium project and Rafflesia, featuring 460 units of three-storey semi-detached bungalows, which collectively will generate a gross development value of RM3.5 billion over the next 10 years. 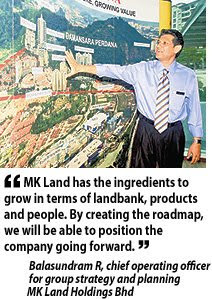 "MK Land has the ingredients to grow in terms of landbank, products and people. By creating the roadmap, we will be able to position the company going forward," chief operating officer (COO) for group strategy and planning, Balasundram R, said. "We need to identify the strength of MK Land and how to make it profitable in the longer term," he told Business Times in an interview. MK Land had posted losses in the financial year ended June 2007/2008 for the first time since its inception more than 10 years ago due to additional cost incurred to complete projects. 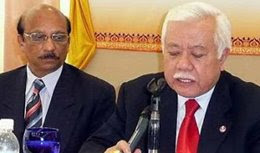 The higher costs was a result of errant contractors being terminated, which happened after its major shareholder Tan Sri Mustapha Kamal Abu Bakar stepped down as executive chairman in April 2007 to focus on his private companies. Mustapha later returned to helm MK Land in June 2008 in the hope of turning the company around by outlining a three-year plan to rejuvenate it. The plan included identifying Balasundram, Fatimah Wahab, Lau Shu Chuan and Yusof Abu Othman as COOs to handle specific tasks in MK Land such as strategic planning, finance and projects in the central and northern regions. The four were roped in from within MK Land, Mustapha's Emkay Group and its 75 per cent unit, Setia Haruman Sdn Bhd, the master developer of Cyberjaya. Since then, MK Land has been able to make profits via cost-efficiency and improving product sales. The company made a net profit of RM10.1 million in the six months ended December 31 2008, against a net loss of RM18.3 million in the same period of 2007 while revenue doubled to RM125 million. MK Land is optimistic to repeat its performance in the second half of its financial year, with revenue surpassing RM350 million, boosted by land and property sales. Balasundram added that there was a challenge that Mustapha had placed on the four but they are on target now to achieve the plan mapped out. "Our initial stage was to build cash flow and sell existing property stocks. As completed products are now tapering down, we are moving to the next step which is to focus on new launches in our road to profitability," he said. The company will also continue with its existing developments in Cyberjaya, Damansara Damai and Ipoh, Balasundram said. BINA Puri Holdings Bhd, a construction group in which tycoon Tan Sri Syed Mokhtar Al-Bukhary holds a minority stake, is increasingly looking towards the Middle East to replenish its order book amid the global slowdown. Already, it has bid for some RM2.5 billion worth of jobs including the construction of high-rise residential and office towers there. Founder and group managing director Tan Sri Tee Hock Seng said the group is looking to replenish its order book and believes that the Middle East in particular the United Arab Emirates (UAE) will provide the support. Its order book stands at nearly RM3 billion, which will keep it busy for the five years. "We are bidding for jobs, especially in Abu Dhabi, to build medium- to high-end residential towers. Abu Dhabi is where the money is," Tee told Business Times in an interview. Its biggest achievement in the Middle East has been in Abu Dhabi, where the group, as part of a larger consortium, won a RM444 million contract from the Tamouh Group to build two 45-storey residential towers. The contract was awarded in 2007 and the consortium is expected to finish building the towers by December this year. Tee also said Bina Puri is focused on growth this year to ride out the current slump. "Business has to go on so the group could be the top runner when the economic recovers. It is all not that bad or gloomy. There are still plenty of jobs in Malaysia and overseas, but you need the right people to look for them," Tee said. For the first four months of 2009, Bina Puri has managed to secure close to RM1 billion worth of projects in Brunei and Malaysia. These projects include some RM300 million worth of government projects in Sabah to build houses and offices, and the construction of Universiti Malaysia Kelantan. In Brunei, it was given a contract in February by the Brunei Economic Development Board to build 2,000 houses for RM693 million. Tee said Bina Puri is looking for more residential and infrastructure projects in Brunei. He said the group is also sourcing for new opportunities in Thailand, although it has RM1.7 billion worth of contracts in hand to build houses over the next three years. The construction group's net profit fell by 38.6 per cent to RM4.3 million in the year-ended December 2008, although revenue was up by 11.4 per cent to RM677.3 million, attributed by higher building material costs and losses incurred by an associate company. MK LAND Holdings Bhd is planning a new wave of development at its integrated Damansara Perdana township in Selangor and this includes the launch of more than RM5 billion worth of properties over the next decade. While the company is targeting purpose-built buildings to enhance its margins, its focus for the next 10 years will be to develop Armanee Terrace Condominium and Rafflesia for RM3.5 billion, its chief operating officer for central region, Fatimah Wahab, said. Launches at Damansara Perdana have been slow since 2007, as MK Land was consolidating its position to focus on other key aspects of its operations. Since July 2008, a repositioning was carried out with the view to bring the company to a better strategic and financial position to meet the challenges ahead. The township, which is 44 per cent developed, has accumulated sales in excess of RM2 billion since its launch in 1996. Fatimah told Business Times that she is optimistic that the luxurious Armanee Terrace and Rafflesia projects, which are supported by a high-end integrated security system and surrounded by greenery, will be the main driving force for growth at Damansara Perdana. The township has received encouraging response from home owners and investors due to its offerings and location, being in the prime area of the Damansara Perdana enclave amid a primary forest - best of the best location in Damansara Perdana, Fatimah said. The Balinese-inspired Armanee Terrace features homes with sky gardens and broadband-ready features. It is the first high-rise development in Damansara Perdana with a garden in every unit. Rafflesia is MK Land's first landed residential property at the township. "We did a market survey on what people want and upon conclusion, learnt that they are looking for properties like Armanee Terrace and Rafflesia which has, among others, high returns on investment," Fatimah said. She added that properties in Damansara Perdana would usually appreciate by 25-30 per cent upon completion, making them appealing to buyers. Armanee Terrace will feature several condominiums in a horseshoe offering various designs of exclusive units. The first block has been constructed and handed over to buyers in 2007, while the second block, comprising 518 units, is under construction and being offered for sale. Fatimah said the last two or three blocks may end up as boutique developments or duplexes where it will offer less units but with bigger built-ups. On Rafflesia, MK Land will offer a total of 460 units of triple-storey semi-detached modern homes. It launched the first batch of 56 houses, priced from RM1.4 million each in 2007 with 60 per cent sold. 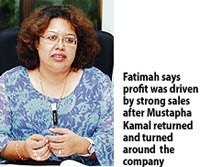 Fatimah said the company will launch 60 new units in July, each priced from RM1.8 million. AMY Chung, 2nd Home Intl (MM2H) Sdn Bhd executive director, Chung believes the MM2H programme has been growing from strength to strength over the years. 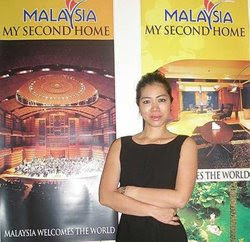 AMY Chung, 2nd Home Intl (MM2H) Sdn Bhd executive director says ... It is a win-win situation for everyone to aggressively promote the programme as it will benefit all sectors of the economy. “There’s a lot going on for this country ... the tropical weather, high standard of living, good healthcare and infrastructure, all at an affordable price,” he said, adding that MM2H was the perfect vehicle to market Malaysia to the world. PETALING JAYA: The Government’s move in February to further liberalise the Malaysia My Second Home (MM2H) programme has been well received by foreigners and industry players, especially MM2H licence operators. Currently, there are about 200 such operators nationwide. Several amendments to the MM2H criteria were made by the authorities, including the lowering of entry age (below 50) as well as employment opportunities for foreigners in selective industries. MM2H Agent Association president Kirby Lim said the programme had undergone significant improvement every year since it took over from the Silver Hair scheme, which began in 2002. “It shows that the Government, particularly the Tourism Ministry, is fully aware of the importance of MM2H as a key driver to economic growth, bringing in billions of ringgit, which is why it (MM2H) has been promoted heavily as a national agenda,” he told StarBiz. Lim said while there might be some “hiccups” along the way, generally, most players or those who benefited from the programme were satisfied with the progress made. “Of course, more can be done and there will always be issues that need to be ironed out, but we are making good progress and the association is in close contact with top officials from the Government, especially the Tourism Ministry,” he said. Lim said the association would convey the concerns of the licence operators and MM2H participants to the relevant authorities. It would also keep them abreast on the effectiveness of the policies in attracting foreigners under MM2H, and the changes needed to improve the logistics and marketing and promotions undertaken currently. On the success of the MM2H so far, Lim said despite not being well marketed in its early years, the programme had been fairly successful. “However, the Government has recently been very aggressive in promoting it and under the stewardship of Tourism Minister Datuk Seri Ng Yen Yen, we believe the programme will gain significant momentum,” he said. Currently, there are about 12,000 MM2H participants from countries such as China, South Korea, Britain, Bangladesh and certain parts of Europe and the Middle East. Lim said the Tourism Ministry had recently embarked on a blitz to promote Malaysia, particularly in China and Japan, as a favoured destination to visit as well as to stay and retire (under the MM2H). “We understand the Tourism Ministry is now looking to promote MM2H in other countries like Canada through exhibitions and other promotional activities,” he said. Currently, Ng is in Britain to woo more tourists to Malaysian shores. She is targeting at least 10,000 Britons under MM2H. So far, 1,551 Britons have signed up for the programme. Lim said foreigners also had the opportunity to own properties and would not be subjected to real estate property gains tax should they sell their assets. “Moreover, the Malaysian hospitality is second to none as many foreigners have remarked that the locals are extremely warm and friendly,” he noted. Lim is optimistic that the number of MM2H applicants will be higher this year. “This is following the liberalisation of the entry level as well as the strong promotions made by the Tourism Ministry, Immigration and Home Affairs Ministry and other government departments,” he said. MUMBAI: India’s Housing Development & Infrastructrure Ltd (HDIL) said late last Saturday its board had approved selling shares for up to US$600 million (US$1 = RM3.50) to institutional investors. HDIL, the latest firm to look at an equity sale after a strong stock market rally, said in a stock exchange statement it would seek shareholders approval for the share sale and a share warrants issue to founders on June 17. India’s benchmark index has risen nearly three-fourths from its lows in March prompting firms to look at share sales. PETALING JAYA: Property developer S P Setia Bhd has won the FIABCI Prix d’Excellence Award 2009 in the Best Master Plan Development category for the second time. President and chief executive officer Tan Sri Liew Kee Sin said the international award showed that a Malaysian company was capable of meeting international standards in property development. “The recognition by FIABCI International affirms our commitment to continuously raise the bar in terms of innovation, product, service and quality in all our projects,” he told StarBizWeek in an email reply. S P Setia received the FIABCI Prix d’Excellence Award 2009 in the Best Master Plan Development for its eco-themed project in Johor Baru, Setia Eco Gardens, from the Paris-based International Real Estate Federation (FIABCI) in Beijing on Wednesday. In 2007, Setia Eco Park in Shah Alam won FIABCI’s Best Master Plan Development award. The win puts Setia Eco Gardens among other global real estate gems such as the Twin Waters on the Sunshine Coast in Australia, Trump World Tower in New York, Gardenville in Singapore and Tokyo Bayfront East in Japan. Liew said the first award to Setia Eco Park spurred the group to look at new ways of sharing the eco concept with home buyers. “We took the best eco-inspired elements from our Setia Eco Park high-end project in the Klang Valley and adapted it to suit a mass residential township in Johor Baru,” he said. The 948-acre freehold Setia Eco Gardens located in the heart of Iskandar Malaysia is being developed based on the premise of an environmentally-friendly township. The project has total gross development value of RM3.5bil, comprising 6,600 residential and commercial properties. To-date, 95% or 550 eco-homes have been sold with total value of RM140mil. ISKANDAR Malaysia in Johor is set to become a major trading hub in the region for manufacturers and buyers once a permanent one-stop exposition, trade and distribution centre near Pasir Gudang is completed in five to seven years. Called the "Asia Pacific Trade and Expo City" (APTEC), it is located within the RM6.6 billion township of Lakehill Resort City, which is being developed by Malaysia Pacific Corp Bhd (MPCB). Once completed, APTEC will have a built-up gross floor area of about 4 million sq ft, occupying a land area of 9.4ha. MPCB president and chief executive officer Datuk Bill Ch'ng said APTEC would become a centre for manufacturers of all sizes to showcase their products to international buyers. "Buyers will come to the hub just like in a department store. These buyers will be retailers and wholesalers. 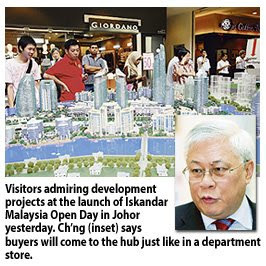 "The hub will be the centre to supply goods for the regional market, and allow buyers from all over the world to source their products here," said Ch'ng after attending the launch of the Iskandar Malaysia Open Day in Johor yesterday. Manufacturers who set up their base in APTEC will promote their products to buyers from Southeast Asia, India, Japan, South Korea, Taiwan and the Middle East. Ch'ng said potential manufacturers at APTEC would be selected based on the potential of their products or services. They include manufacturers of goods such as electronics, fashion, home appliances and foodstuff. Investors and traders will also find accommodation and recreation at the Lakehill Resort City to complement their business dealings. Other attractions in the development include a six-star lakeside resort, factory outlet stores, a heritage and cultural village, a thematic restaurant located on top of a rock formation and other international bistros and cafes. DEVELOPERS should act as agents of change and introduce more value-enhancing elements into their housing developments to promote higher quality neighbourhoods and environments for the people. Through their projects, especially green field developments, developers are opening up new frontiers and bringing progress to society. Every developer, irrespective of size, market capitalisation for listed companies, financial strength and expertise, has a role to play and contribute towards enhancing the country’s property landscape and living environment. Although the market is still quiet with very few new project launches, the lull in the market provides developers the perfect opportunity to review their project plans and enhance them with more resident-friendly features. Whether they are high-, medium- or low-cost projects, developers should plan with an eye for quality and go the extra mile to turn them into wholesome neighbourhoods for the residents. Ultimately, these projects will be homes to many families and equipping them with the necessary facilities such as good landscaping, sufficient social amenities, adequate recreational areas and comfortable common facilities for social interaction, will promote more friendly neighbours and interaction among the people. Developers are certainly one of the frontliners that have the clout to institute the necessary changes through project planning to help realise the Government’s 1Malaysia vision of greater unity and caring towards one another. With rising concerns on safety and security issues following the growing number of crimes in the country, gated and guarded housing projects are growing in popularity and more developers are moving into such developments to meet the rising demand. However, it must be noted that such housing projects are also not fool-proof and there have been quite a number of break-ins and security breaches in those housing estates. Even if these projects provide a sense of security and safety for residents, the issue is whether the residents of gated and guarded projects feel safe and secure when they step out of their housing enclaves. They should if crimes in the streets are kept at bay. The good old ways of ensuring safety through good neighbourliness, closer interaction and looking out for each other’s well-being, which have been lost somewhat in this rat-race age, have been proven to be effective and should be revived. Even if a project is low- or low-medium cost, the lower income groups deserve to enjoy good quality housing and facilities, as well as a secure and safe environment. Developers should not just build these units to fulfil the low-cost housing requirements set by the authorities but should add value to these affordable homes. Reducing the density and number of units of these projects will avoid overcrowding and reduce the chances of these projects turning into urban slums like what has happened to certain affordable projects. Proper maintenance of the facilities including lifts, playgrounds and other shared facilities will ensure the comfort of residents. To enable developers to contribute towards sprucing up these low-cost projects with better amenities and quality homes, it would be worthwhile for the Government to consider their calls to raise the low–cost housing ceiling price to RM60,000 from RM42,000 currently. It would also be good to look into the model adopted in Sarawak where people-friendly housing schemes are being built to promote home ownership. By working with a panel of financial institutions to offer preferential rates for such housing schemes, buyers only have to fork out affordable monthly repayment of less than RM300 for their housing loans. And to overcome concerns of the many unoccupied low-cost houses in various parts of the country, developers and the authorities should avoid locations that are non-prime areas or inaccessible. Due feasibility studies should be undertaken to ensure supply matches demand. >Deputy news editor Angie Ng sees many opportunities for developers to shine through their value-enhancing capabilities to spruce up the living environment. GREATER adoption and use of environment-friendly planning techniques, designs and “green” materials in property projects will go a long way towards promoting green practices in the country. Rather than depending on legislation to make it mandatory for industry players to incorporate pro-environment design features in their projects, it will be more effective if industry players voluntarily adopt green and environment-friendly designs and concepts in their projects. 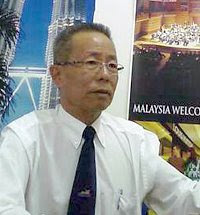 Veteran tourism operator and hotelier, Anthony Wong, who is group managing director of Asian Overland Services Tours & Travel Sdn Bhd and The Frangipani Hotels & Resorts Sdn Bhd, should know the importance of personal initiative to adopt the green way of life as he was already a “green” practitioner in 1976 at the tender age of 19. That was when he started his eco-tourism company, Asian Overland Services Tours & Travel with a few partners from Australia and the US to arrange inbound tours for foreign groups to go on back-to-nature eco expeditions and to savour the rich flora and fauna of Malaysia’s jungles. These trips include staying in longhouses, jungle trekking, caving expeditions to Niah and Mulu caves and other eco-nature tours in Taman Negara and Belum National Park. Wong, who took over the company in 1980 after his partners pulled out, is still going strong with his company arranging at least 180 to 250 eco-tours for about 6,000 to 8,000 tourists a year. The company records annual revenue of between RM5mil and RM6mil. His company also organises nature camps for business executives and students during the school holidays at its Jungle Lodge facility at 14th Mile Jalan Gombak, Kuala Lumpur. The facility is surrounded by a 100-year-old rain forest. At his “green” hotel in Langkawi, The Frangipani Langkawi Resort & Spa – a four-star deluxe property with 118 villas, he says green practices including the 4 “Rs” (reduce, reuse, recycle and rethink initiatives) are adopted for proper waste management which literally “turn rubbish into gold”. Water and energy conservation are also steadfastly adhered to. The company also plants its own organic fruits, vegetables and herbal teas for its guests. Wong says the Government should consider offering tax incentives and capital write-offs for cost incurred by industry practitioners to promote more green practices. “Even exporters should start adopting green practices as there is talk that many European countries are looking into sanctioning exports from non-green-compliant countries as a measure to arrest environmental deterioration,” he says. The Government’s initiative to ensure new government buildings feature energy-saving and other pro-environment measures is a good start to promote the green culture among property industry players. Thursday’s launch of the Green Building Index (GBI), Malaysia’s very own certification scheme for sustainable buildings, is also part of the effort to green the property industry. The GBI, developed by the Malaysian Institute of Architects (PAM) and Association of Consulting Engineers (ACEM), will encourage developers of housing and commercial projects to adopt environment-friendly features such as energy-efficient elements, rain harvesting and conservation of original land form and vegetation. “If a building is constructed with the right green designs and features, it will reduce energy cost by 50%, which is a substantial saving as energy easily makes up 25% of a building’s operating cost. Together with other forms of savings, green buildings can cut operating costs by about 60%,” he adds. The Clearwater Group aspires to turn its 240 acres in Seri Kembangan, Selangor, into an eco-friendly development under founding member and managing director Dian Lee Cheng Ling. Known as Bluwater Estate, the leasehold gated and guarded development appears to be Dian’s most ambitious project to date. Since her return from Australia where she studied communications, the eldest daughter of property developer Tan Sri Lee Kim Yew has been busy with several property projects. Clearwater Developments Sdn Bhd was set up by Dian and three partners in 2006 and their first project was serviced apartments, Clearwater Residences in Damansara Heights. Since then, she has added three brands to the group – Clearwater, Bluwater and The Heritage. Clearly, the younger Lee would like to focus on eco-friendly projects. Yesterday, she flew off to New York’s Pratt Institute for a seven-week course on Sustainable Designs. “It will cost quite a bit as Pratt is one of the premier design school in the United States for interior and architecture. I will also be taking my toddler son Jedi and his nanny with me,” says Lee. She says motherhood has changed her and given her a new perspective on development. “I’ve become more conscious of the environment we live in, the activities we can do to make this planet a better place for our future generations,” says Lee. Lee has brought in Environmental Resources Management Ltd, a provider of environmental consulting services, to build Bluwater. She will be looking at four aspects – water, energy, landscape and waste management. On the energy aspect, she says that at this preliminary stage, she would like all the 1,000-odd households to have solar heaters. She will also encourage the use of bicycles and buggies to go to the clubhouse instead of cars. The properties there will be designed and built in such a way as to enable owners to collect rainwater for use. There are plans to keep the lake as clear and clean as possible for water sports. The open-cast tin-mine lake will have lake-front bungalows. Right now, there are already two – her family’s weekend home and another which belongs to her father’s friend. Lee says that after building several properties, she does not want to just build yet another project. During a site visit, Lee says although there are some high tension cables running pass the main entrance, they do not cut across the housing estate. The Bluwater Estate, formerly known as South Lake, used to belong to Mines Resort Bhd which was privately held by her father. She and her partners bought it at a “fair price” at a time when her father was scaling back his privately-held local property development activities. She has also taken over a serviced apartment project fronting the lake, The Heritage, from her father. Today, 600 of the 800 unit-project is tenanted. One of the blocks, comprising 200 units, will be sold en bloc. “When the economy picks up, that will be sold. As it is, there is already a waiting list for those who want to rent units at The Heritage. “With six universities and the Australian International School, which is located on Bluwater itself, we are confident there will be people who will want to invest in this area,” she says. The studio units are already generating 8% to 10% yield for the owners (with rental of RM1,400 to RM1,500 a month), while the two- and three-room unit cost RM2,300 and RM2,500 to rent respectively, at a slightly lower yield. The project is located across the highway from Mines Shopping Centre and fronts the lake in Bluwater Estate. Bluwater is about 20km from the city and is served by the Besraya Highway, which is linked to several other highways. However, The Heritage, although adjacent to Bluwater, will not be part of the gated and guarded development. In the next couple of months, Lee aims to launch vacant bungalow land on Bluwater Estate at RM150 per sq ft. These lots will be between 8,000 and 12,000 sq ft. Known as Bluhaven, there will be 18 lots initially. The development will also have townhouses priced from RM850,000, semi-detached residential units and condominiums. These will be launched later. ESTABLISHED brands such as Sushi King, Secret Recipe and PDI are making inroads in secondary cities like Kluang in Johor. Sushi King's outlet at Kluang Mall for one, is enjoying robust sales with long queues of people waiting to grab a seat during lunch and dinner. In 2005, when Majupadu Development Sdn Bhd managing director Tey Ah Kau conceptualised the idea of building a lifestyle mall in Kluang that later would be the pride of the town, many were doubtful if it would work. "After three years of research, we made a bold decision to move ahead of others here. We dared to develop something that many were pessimistic about. 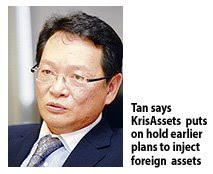 People wondered whether residents in Kluang would be willing to spend," Tey said. With the guidance of retail consultant Richard Chan of RCMC Sdn Bhd, Tey decided that there was a still a need to fill an obvious gap despite existing competition. "We take a long-term view," said Tey, who has been a property developer for the past 21 years. Today, the RM100 million Kluang Mall with a 800,000 sq ft gross area is the largest in the town, with a primary catchment of 300,000 and a secondary catchment of 1.2 million from Batu Pahat, Muar, Pontian and Segamat. 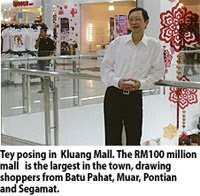 Kluang Mall, which opened on December 24 2008, is developed and operated by Tenaga Nusantara Sdn Bhd, also owned by Tey. Kluang Mall's tagline "Shop like a City" has worked in its favour as the mall has been performing satisfactorily since its opening. Seventy-nine per cent of its net lettable area has been filled. Tenants, including Popular Book Store, Pacific Hypermarket, Pacific Department Store, Big Apple and Laksa Shack, drew 417,000 shoppers in February this year and 375,000 shoppers in March. Meanwhile, Tey expects return on investment for the mall typically in seven to eight years. Built on 2.63ha within the town centre of Kluang, the mall aims to cater to the younger Kluang generation who want finer things in life. The entire mall has WiFi connection. JOHOR BARU: Johor Land Bhd (JLand) has decided to abort its plan to acquire 50.98% equity in Windsor Trade Holdings Sdn Bhd (WTHSB) for RM15mil cash. Chairman Tan Sri Muhammad Ali Hashim said the decision was reached after considering the current global economic slowdown. He said JLand had earlier proposed to buy the stake in WTHSB to diversify its business activities to improve its earnings base. “However, we want to focus on our core business of property development as the segment is becoming more challenging now,’’ Ali said after the company’s AGM yesterday. WTHSB, through its 80%-owned subsidiary Windsor Trade Sdn Bhd, has been granted a 30-year concession to operate the barter trade terminal, Sandakan Integrated Trade Exchange Terminal. The Sabah government, through Sabah Economic Development Corp, owns the remaining 20% stake in Windsor Trade. The development of the terminal is estimated to cost RM315mil, inclusive of land cost, pre-development cost, construction of infrastructure and buildings, and equipment. “We have a 1,102.79ha land-bank and we are looking at RM7bil in gross development value (GDV) when the land is developed over the next 10 to 15 years,’’ Ali said. At present, JLand is undertaking three property projects – Taman Bukit Dahlia, Bandar Tiram and Bandar Dato’ Onn. The 168.75ha Taman Bukit Dahlia in Pasir Gudang, expected to be completed by 2010, will have 4,100 units of mixed properties. The self-contained Bandar Tiram township on a 485.62ha site, with 12,300 units and RM2.6bil GDV, is due for completion by 2020. JLand’s latest project, Bandar Dato’ Onn is located 12km from Johor Baru City Centre. It is sited on 612.69ha and is to be developed over the next 10 years. The project boasts 17,800 properties and a GDV of RM4bil. Ali said the company would be launching the Bandar Dato’ Onn Regional Commercial Centre this year. “Covering 47.75ha, the centre will provide about one million sq m of floor area, making the township the largest commercial centre in Johor Baru district,’’ Ali said. For the year ended Dec 31, JLand recorded pre-tax profit of RM25.29mil on revenue of RM138.69mil compared with RM8.29mil and RM63.36mil respectively in 2007. CITITEL Hotel Management Sdn Bhd (CHM) is looking to tap visitors from China and India for its Cititel Penang property. Cititel Penang general manager Jeffrey Goh said the hotel is keen to attract both the leisure and business segments in the two markets. He said it is currently working with local agents in Penang to create attractive travel packages to penetrate the Chinese and Indian markets and sell the island state as a Unesco heritage-listed destination. "Malaysia currently serves as our main source of business, which makes up 55 per cent of our total market," he told Business Times in Penang. "We expect to enter these new markets by the fourth quarter of the year," he added. Apart from the domestic market, the Japanese market accounts for another 16 per cent of the hotel's business, while Thai visitors make up 8 per cent. Cititel Penang has recently invested RM2 million to refurbish its ballroom and superior rooms. On the influenza A (H1N1) outbreak impact, Goh said: "There has been minimal impact with total cancellation of less than five room nights in total."